The last time I went to Italy in October of 2013, a friend from home asked me to get her some Lampo Cotone Povero yarn to make tassels. It proved to be a difficult task and I was unable to get her any. We've talked about Cotone Povero before here on the blog. It is a 100% pure soft cotton yarn with a matte finish used in Italy to make tassels and for stitching Caterina de'Medici embroidery among other things. At one time in history it came in many colours but now I believe you can only get natural or white though ebay searches still turn up other colours from time to time. The balls are 50 grams at about $3.00 USD each and you can make a lot with one ball. The yarn is made up of 6 threads twisted together. It is available from various places online like Tombolo Disegni, Ricamiamo-Insieme, Bergamasco, etc. but I was unable to find it in any store I walked into in Rome, Florence or anywhere I was in Puglia. This is not to say it's not there, I just couldn't find it. 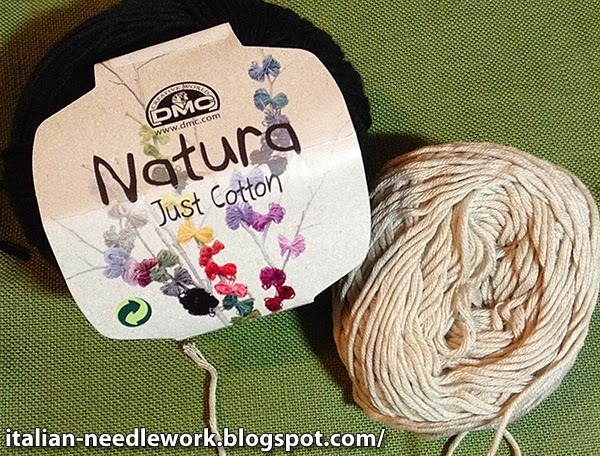 Upon returning home I was told by an Italian friend that DMC makes a soft cotton yarn which is a nice substitute called Natura Just Cotton. It comes in many colours and is available outside of Italy though not in North America that I could find at the time. I ordered mine from Sew and So in the UK. The balls are 50 grams and the yarn is made up of 8 twisted threads. I see it is now listed on the DMC US website but internet searches for resellers still result in mostly UK sources. Price is about $4.00 USD. 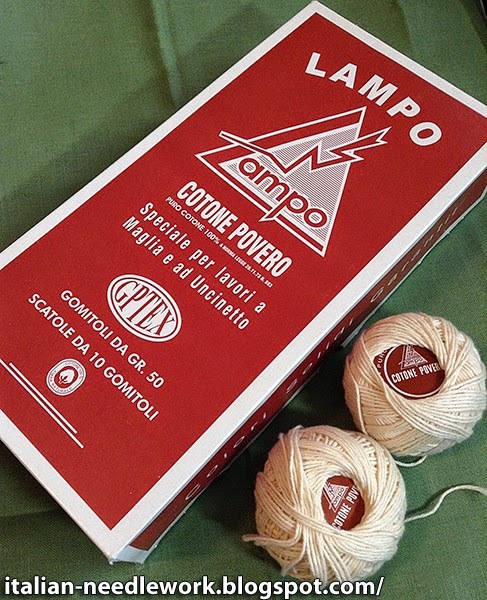 Lampo Cotone Povero on the top, DMC Natura Just Cotton on the bottom. Comparing the two yarns, they are not identical but I decided to go all the way through an experiment to see if I liked the Natura anyway. I'm not sure that you can see, but the Cotone Povero is ever-so-slightly thicker and it's hard to tell from the photo but the Natura is slightly less "matte" than the Cotone Povero. While in Phoenix last October at the EGA National Seminar, I bought a Deruta ceramic fuserola bead that my daughter picked out for herself, she wanted a tassel to match her camera strap. I got DMC Natura in black and Sable to match the bead. Battery operated cord twister we dubbed the "zip-zip". Using my fantastic new favorite tool, a battery-operated cord twister developed by a lady in Assisi which we lovingly dubbed the "zip-zip" as it makes cording in a zip - I made many many twisted cords. I think the real secret to tassel-making is that when you think you have enough, make more. Tassels should be full and not skimpy. Then the knotting process began and I knotted my cording until my fingers were beyond sore. Next step is to string the cut pieces onto yarn as you would when stringing beads, see this tutorial here. Odd numbers are best, so groups of 3, 5, 7 or 9. 7 "legs" are made up of 5 groups of 9 pieces. 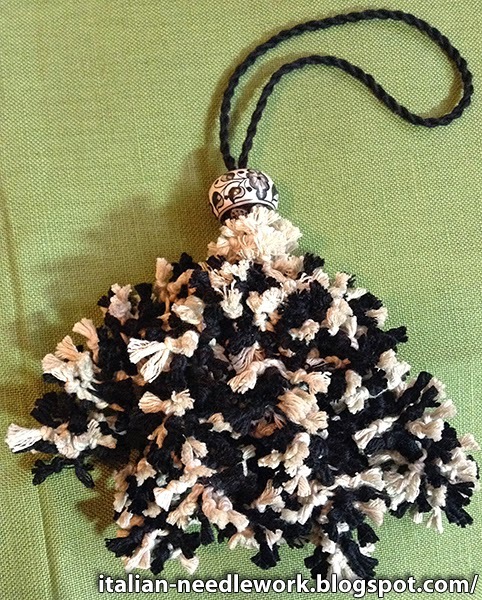 There is a cluster at the top of solid Sable and I used Black to string everything together. I'm pretty happy with the result and I like the fact that DMC Natura comes in so many colours. For tassel-making I think it is a fine substitute for Cotone Povero. Next task will be to do some experiments in using it for Caterina de'Medici embroidery. I'm a little concerned that it may be too thin for the Buratto fabric and that the coverage won't be as good, but that's for another time. Do you know of a soft, matte finish cotton yarn available in North America that I could investigate as a substitute for Cotone Povero? If so, please leave a comment below!